Black flies are very annoying pests and can cause very painful and irritating bites. The females lay eggs on objects in running water such as creeks, streams or ditches. 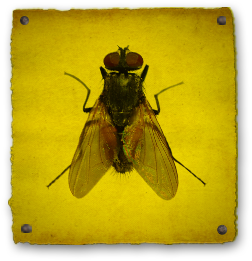 Keeping doors and window screens in good repair can help keep black flies out of the house. In addition to using insect repellents, wearing long sleeve shirts, long pants, and netting for face protection can reduce bites from black flies when outdoors. Spraying larger, outdoor areas with an insecticide labeled for this use can help reduce black fly infestations.